The Motorola ML900 has been discontinued. No direct replacement is available. 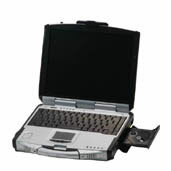 The ML900 ultra-robust, ruggedized laptop meets or exceeds MIL-STD 810F standards. Full-sized and full-featured, it is our most advanced mobile laptop computer, ready to handle the demands of the mission-critical world. Power-packed, feature-rich with advanced specs and enhanced functions that make it easy to use, the ML900 is ready to take on the toughest tasks and environments. You can depend on the ML900 to handle the demands of your day with its remarkable durability and flexibility.